Our intrepid BUS 345 students will be doing some primary research on J.Crew and clothing retail this term. If you're in that class, see below for some initial thoughts on resources that might be helpful. This approach will also give you Market Size, Company Share, Brand Share, Distribution, and other valuable statistical tables covering clothing retail in Canada (and beyond). Be sure to use the options above each table to adjust the time period and other settings to fit your needs. Also try a search for "J. Crew" (with a space after the period) to get short reports and articles that touch on J. Crew's challenges. 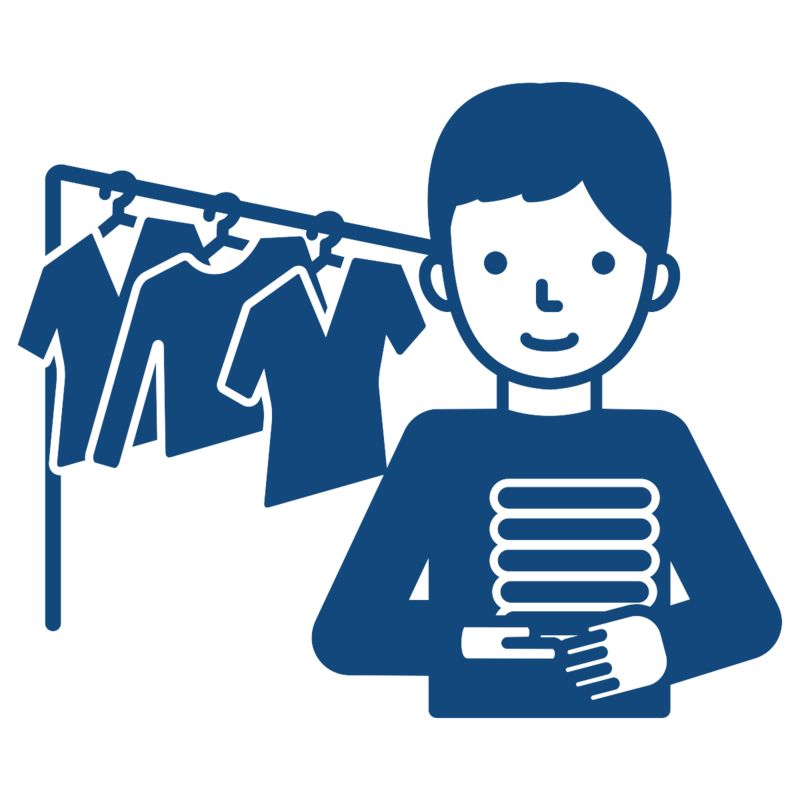 Try searches for terms such as clothing, apparel, or online fashion. Also try major store/brand names. Be sure to follow the links to original sources under the Source tab to the left of each of the charts. Sometimes the original sources of the data presented by Statista will have additional numbers and context to make your research easier. This short 2008 report is from our International Directory of Company Histories. It provides some good background on how the company's strategy changed over the years. Vividata provides detailed data on Canadian consumers and the places they shop, brands they buy, etc. Try browsing the options in the Shopping & Apparel section to start. Note: Vividata is complex to use and understand. See this "Introduction to Vividata" guide and work through the practice questions before you dive into the full database. If you get stuck, ask for help! Factiva covers key news sources, including many industry-specific publications such as WWD (Women's Wear Daily) and Just Style. It's a good place to search if you need recent news on J. Crew and its competitors. 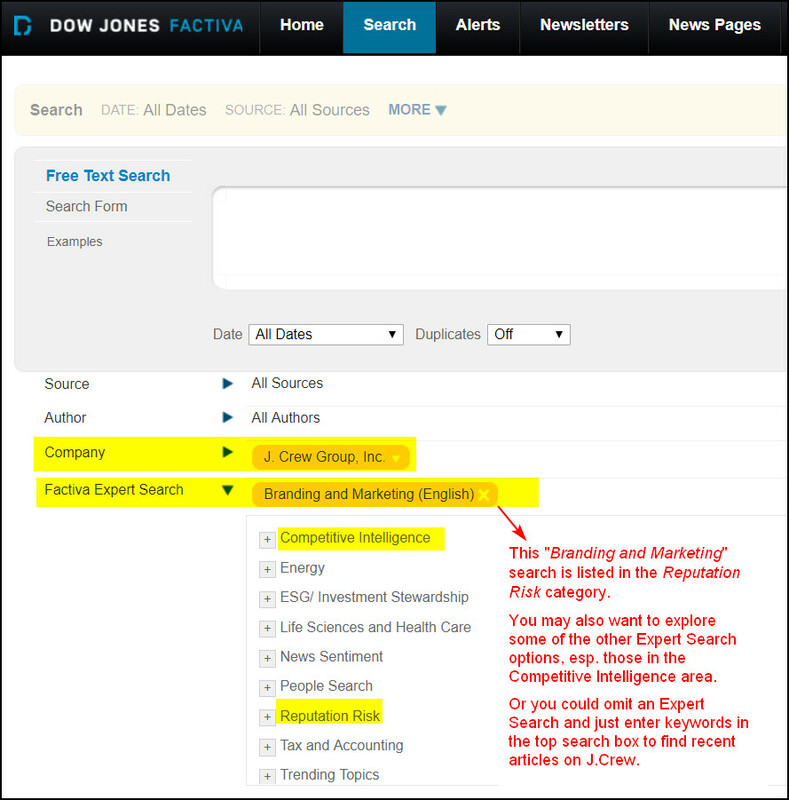 Check out this screen capture of a Factiva Expert Search that may save you some time. Be sure to search both PsycInfo and Business Source Complete for research articles about your topic as the two databases cover different, though overlapping, groups of journals. TIP: Remember that even articles in which the countries, consumer groups, etc. that were studied aren't the same as your target group may still be useful! Do they have methodology details (even actual questionnaires) that you could replicate? Did they run into issues with their studies that you could learn from? In Business Source Complete, start with this rough search to find such articles as the following. TIP: If an article isn't available fulltext in a database (such as the JFMM ones above), click on Get@SFU to have our system check to see if we have it online. A series of books (and ebooks) that list the scales/questions used in academic market research, all indexed by the topic each question was meant to measure. There's a good chance that other researchers have already developed and tested questionnaires to measure something close to what you are studying. Where the Marketing Scales Handbooks allow you to drill down to the level of specific questions on your topic, PsycTESTS is more focused on complete questionnaires. Need a Fashion Consciousness and Consumption Questionnaire or a Consumer Fashion Habits and Attitudes Survey? Start with PsycTESTS! TIP: Don't check off the option to limit to fulltext in PsycTESTS as you will miss some good stuff! Scan the non-fulltext entries for any clues as to what articles the tests covered were published in, then search for those articles. For instance, this test is available in this article.